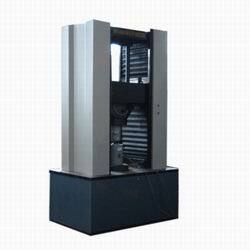 The Build-up Force Standard Machine (Referred to as BFSM) has the characteristics of low price, high efficiency, small volume and convenient use, and has been widely used in the field of force value measurement and detection. Especially in the production of measuring force and load cell, superposition force standard machine is a practical process equipment. Especially in the force measuring and weighting sensor manufacturing, Build-up Force Standard Machine is a kind of process equipment. The BFSM series fully automatic build-up force standard machine is a contrastive force measuring device that uses proprietary technology -- "piezoelectric ceramic force generator," and applied to the computer and micro-electronic control technology. It using the inverse piezoelectric effect principle to produce tiny deformation to impose fine load on load sensor,and The load sensor loading is automatically controlled by the microcomputer control software.It has achieved the goal of accurate control of force value, stable and constant for a long time, and automatic control of working process, as well as reducing the cost. It has the characteristics of high working precision, stable and reliable force value control, simple structure, convenient use and high efficiency, and its cost is lower than any other kind of force standard machine. The BFSM series automatic build-up force standard machine can be used to detect any dynamometer with a load less than the rated load.It can be used to detect sensors with an accuracy level of C5, and the testing items include load characteristics (nonlinear, repeatability, lag, creep) and temperature characteristics, etc.The testing methods and steps are in accordance with the national standards for load sensor detection (JJG669 - 90, GB7551 - 92) and the requirement of OIML - R60 of load sensor international 60.This kind of dynamometer is characterized by its novelty, advanced technology, good practicability and low use cost.After years of use by many users, it has been proved that it is a practical test equipment with high accuracy and high efficiency in the production and metrological verification of weighing sensors and weighing sensors.The key technology of the BFSM series fully automatic build-up force standard machine is also successfully applied to the measurement and control system of the rocket engine thrust test, and its application field is still developing.